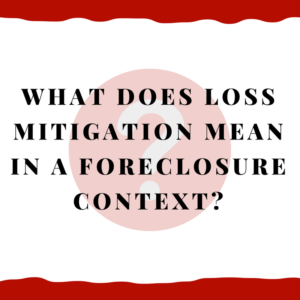 What does loss mitigation mean in a foreclosure context? If you are falling behind on your mortgage, it makes a lot of sense to ask your mortgage company to give you loss mitigation. Normally you will fill out a package — a loss mitigation package — and then the mortgage company will let you know what you are entitled to (assuming they tell you the truth). Note: fill out the package completely and give the mortgage company the information they request if you want the best chance to avoid a foreclosure. If you leave out any documents, the mortgage company is supposed to let you know what you left out and give you a deadline. Be careful dealing with your mortgage company . . . . The mortgage company is also not supposed to lie about receiving your package (a favorite dirty trick). However, you do have to watch this. When you deal with your mortgage company on loss mitigation, you have to be very careful that you are getting accurate information from your company. When in doubt, send “request for information” and “notice of error” letters which we discuss in other videos and articles. These are letters giving the mortgage company a chance to fix errors and/or give you requested information. When they don’t do this, you can sue in federal court for money damages (including $2,000 per violation and normally there are a lot of violations). This tends to motivate these companies to do the right thing. What to do if you want help . . . . If you have questions about your options when facing a foreclosure, especially with how the new RESPA laws can help you with loss mitigation, please feel free to get in touch with us by calling us at 205-879-2447 or contacting us through our website as we know sometimes it is easier to write out your situation rather than try to explain it for the first time over the phone. Hello, we own property in Birmingham and have agreed to go through a deed in lieu process with our borrower. We are having difficulty finding some of the packages, such as the loss mitigation package, that are required in this process. Can you provide assistance to us in this process? We want to get as much paperwork prepared before flying to Birmingham the first week of May. Thanks for your comment and question. I represent borrowers and not lenders. Having said this, I’m not aware of any general or standard loss mitigation package. The consumers I represent are dealing with the large mortgage servicers such as Bank of America, Ocwen, etc. These links may help you — ultimately I suggest contacting a foreclosure lawyer or the CFPB (Consumer Financial Protection Bureau) to see if they can help you. Sorry I can’t help you directly — thanks for reading the article and for your comment and I hope your work with the borrower goes very well!